Me too. Those trees were a signature block. Many, many thank yous for organizing such a fun group! Jill - it's so fantastic! I had so much fun with those trees. Mine were so tiny compared to everyone else's. I'll be bigger and bolder the next time I make them. Thanks so much for the opportunity to learn a new technique. I am thrilled that your trees were a different size! The beauty is in the variety. Thank you for the Color Catcher. I used it to wash this quilt today! This is a beautiful quilt! Thank you for sharing the story with us. Thank you...and thanks for reading it. 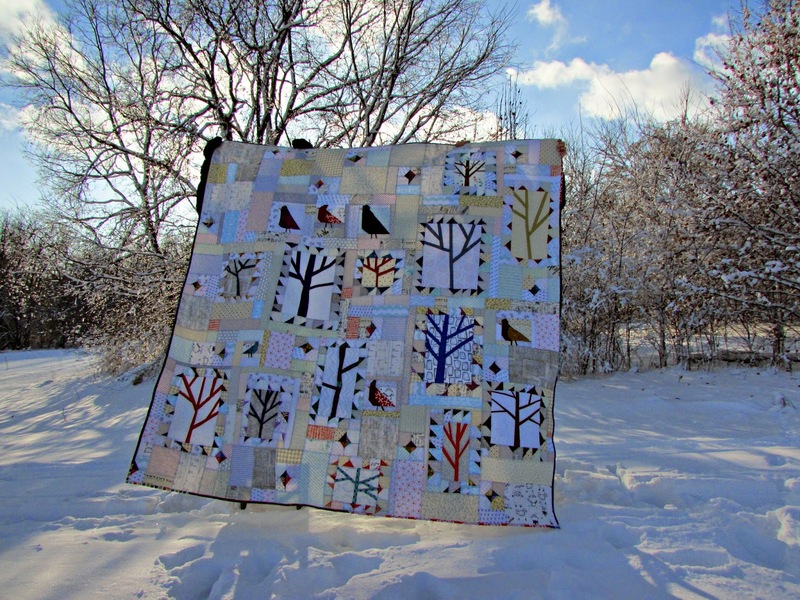 I look forward to your blog posts because of the stories you weave and create just as beautifully as your quilts. I am sorry to hear about your neighbor, and I have to say my heart went out to his golden retriever. And what a lovely memory of the Cardinal to share with your son; it obviously means a lot to him as well. 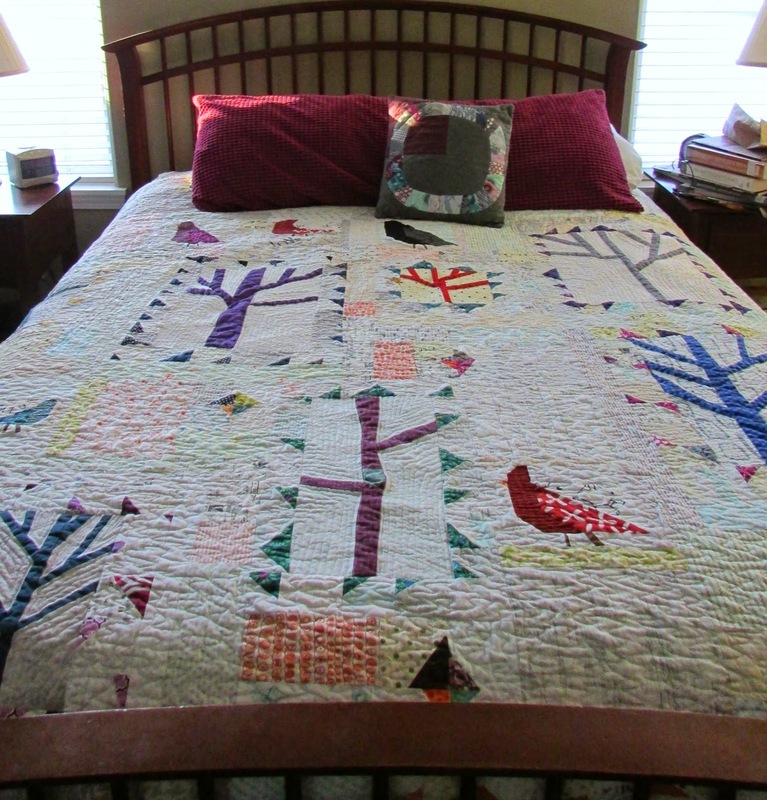 The quilt came together so well, and I really like the extra elements you added as you pieced it together (like the triangles framing trees and birds). Peaches went to live at his daughter's house. I've thought a lot about her too and hope that her transition will be as easy as possible. 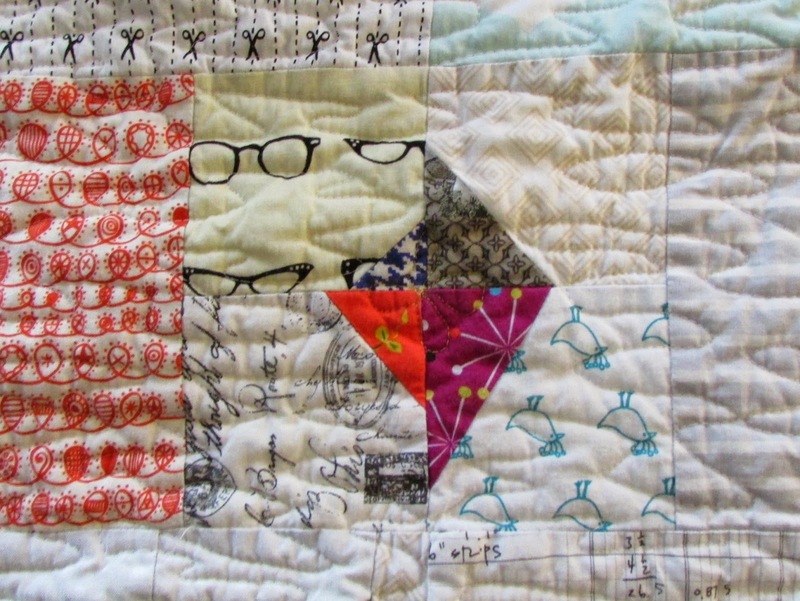 I loved every word of this post, as much as I love this beautiful quilt. I don't normally go for low volume, but there is something very magical and peaceful about this quilt. That is EXACTLY how I feel about it, too. Part of it is the picture my husband said we "froze our baguettes off to get." You are so right! "Different" is good when it's improv. "Different" is very, very bad when it's seam allowances!!! 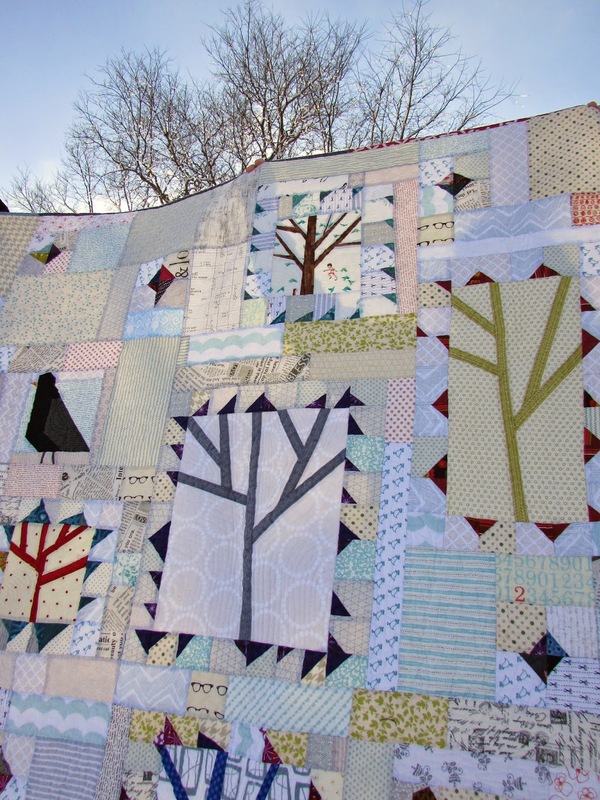 You have turned those trees into such a beautiful design and I love every bit of your quilt! It's so pretty! And it inspires me to go ahead and try something similar. And thank you for your lovely story! Yay! Inspiration to go and make something of your own is the best compliment I can imagine. Share a picture with me when you do! 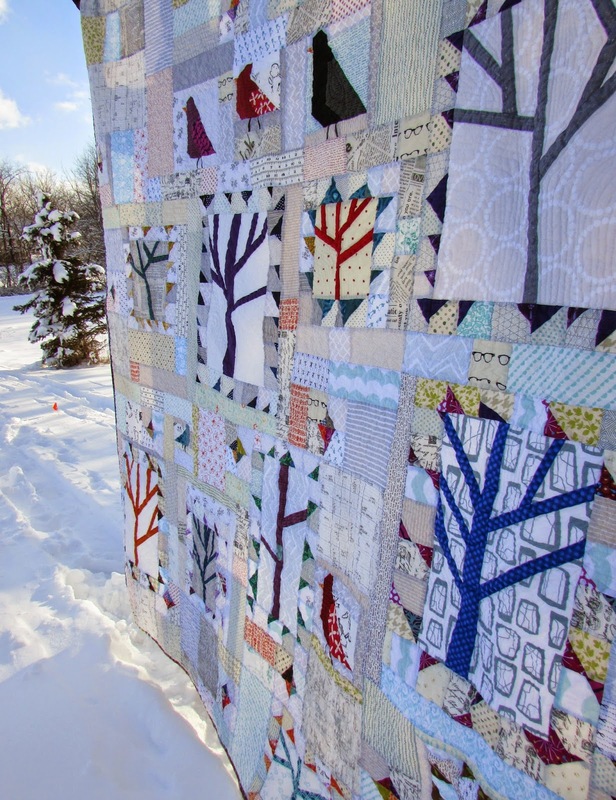 That is beautiful and I loved reading the story of this quilt. That design method looks like fun to try. I hope you do try it. I think it makes improvisation more manageable. This is gorgeous! Great colors and your quilting really works. I have aspirations to be better at FMQ than I am. Maybe some day I will sit down to do the quilting and NOT think, "Oh please don't let me mess this quilt top up!!!" I just adore everythingabout this quilt!!! Thanks! I just looked at your blogs and found all of those great ideas for made fabric. I loved that book! I think a lot of my scraps will soon have a new home! Thanks for all the info about how you plan your quilt design when doing improv. I found it very helpful. 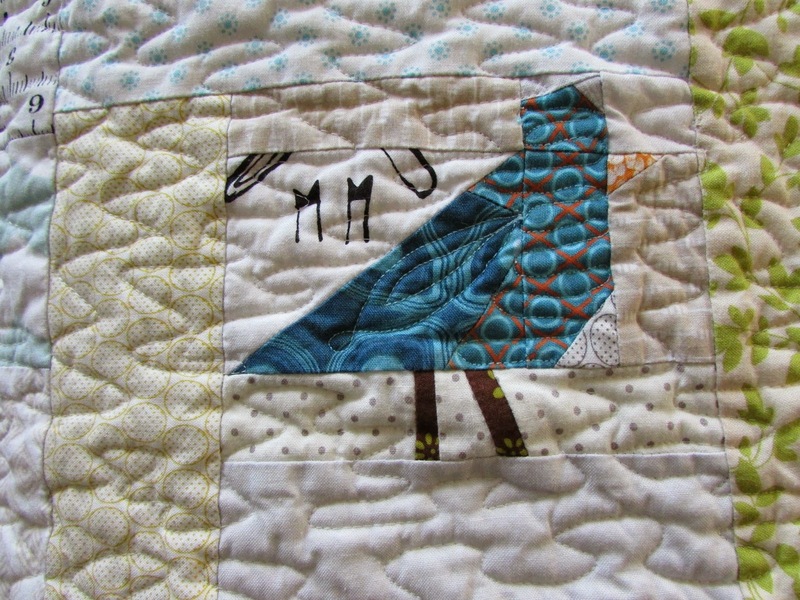 This is another amazing bird quilt!!! I am graced by a pair of cardinals that sit in the evergreen tree in my front yard. It amazes me to see these red birds in my green tree. The female has a red plume and red coloring underneath her brownish gray feathers. I love seeing them against the snow as I feed the wild birds and they came to feast. Yes I will be making a cardinal quilt to celebrate these beautiful birds. I love your quilt too. Did you find the tutorial for the improv birds? I just recently posted it. I do really, really love birds too. I hope you make your quilt soon! I appreciate you reading it more than I can say. Thank you for mentioning me on your blog today. That was very kind. Such a gorgeous quilt! I loved reading about how you planned it out and used scraps from previous projects. I love it! Thank you! We have really enjoyed using it on our bed. I am going to need to get cracking on a new idea soon because the subject matter and the wool batting is giving it a seasonal expiration date! I just found your blog via your birds on flicker. This is a wonderful heartfelt story. Your blog is a treasure. Thank you. What a kind thing to say!!! My heart is here (my family + stories + quilting). I am happy that you liked it and stayed awhile. 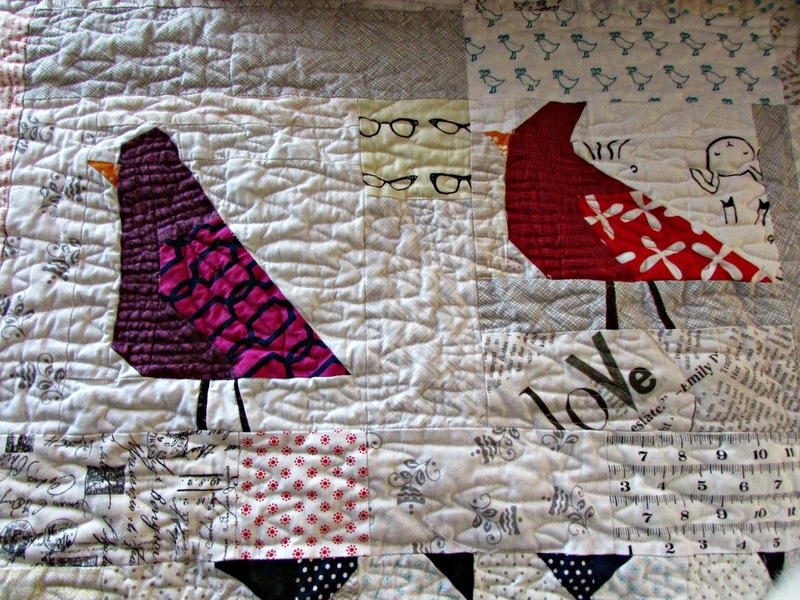 Discovered your blog just now from Finish it up Friday from Crazy Mom Quilts. What beautiful work you do and what a fantastic writer you are!! This piece in particular made me stop and say so. Such sensitivity. Thanks, Kim! I am sorry for the late reply, I just now saw your post! 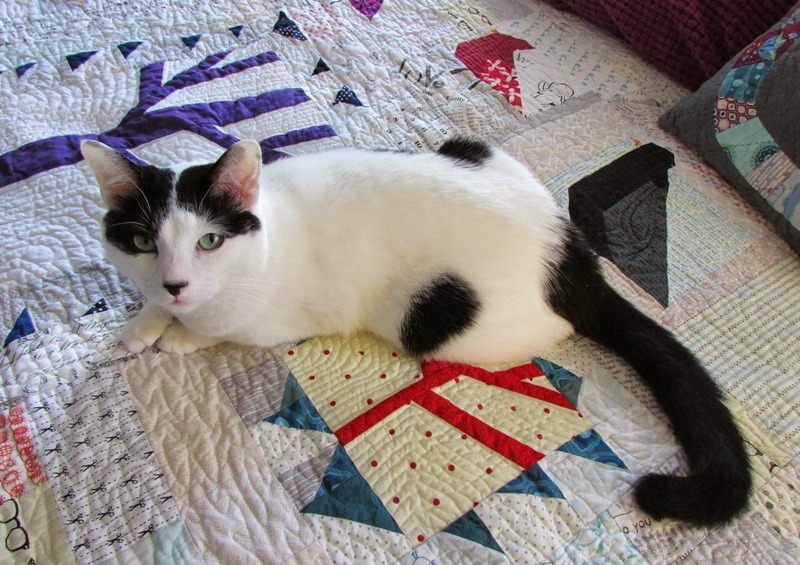 I'm glad you like the writing, I enjoy that part as much as I enjoy making the quilts. LOVE your lovely birds, branches and blanc . What a great comment, Marsha! I love the blanc, as do many other modern quilters. Silence can be golden. Why is the font so small? Old eyes can't handle it. Susie, in Google, type in "increasing font size in ________" (Outlook, Chrome, Windows...whichever you use) and you will find specific instructions to make the font size larger on your computer. That way EVERY website will have the font size that is easiest for you to read. Wow! 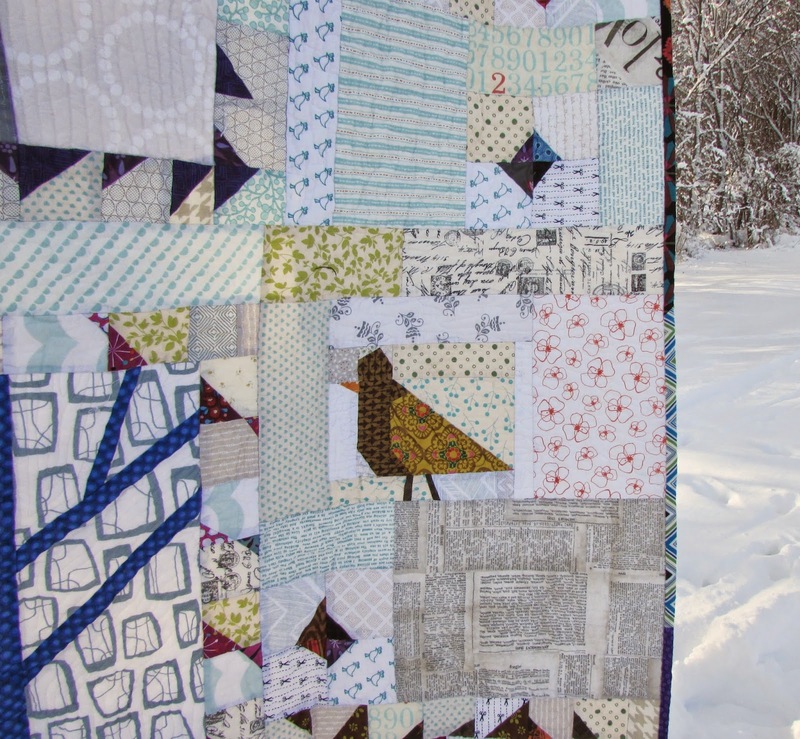 I adore this quilt - from the design, to the colors, to the scraps and most especially the story. Beautiful in every way. Thank you, Luci! This is our bed quilt just because I love to keep it out and not have it tucked away in storage like so many of my other quilts. I am so happy to hear that you like it too! Wow, Jill, your quilt is stunning!! I posted about it here: http://selvageblog.blogspot.com/ And there is a live link there to your blog. I love your improv saw-tooth frames around the trees. Wonderful! Thank you! The sawtooth borders were a later addition to give more emphasis to the trees. I am glad you like it!